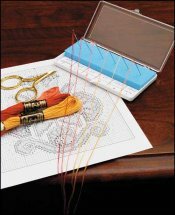 Needle Palette Needle Organizers  - $6.00 : Yarn Tree, Your wholesale source for cross stitch supplies. Item 2923. Needle Palette. Handy, portable little case with a special foam pad to hold your threaded needles. Color/symbol cards keep track of each thread color and the corresponding symbol. Flexible foam allows you to close the lid without removing your needles. Measures 4 3/8”x2”x1/2”. From Yarn Tree.